I'm back. I'm totally exhausted, but I'm back. Actually, I've been back since Monday afternoon but I'm not counting that because I came home, took care of a few things and left again to go see the boys school concert. I'm so bummed. My camera refused to recognize the new card I'd brought for it so I got very few pictures and because I couldn't remember the right camera setting, most of those came out bad. The concert was great though. They did a Broadway theme this year and the kids looked like they had fun. Roger, perhaps more than some, because he spent 95% of his half messing around. Ben, who enjoys these, didn't think he did very well but I totally disagree. He seemed to know all the words and the actions. Afterwards, we all all went out for dinner. Yesterday, I was so totally drained that I didn't do much of anything. Luckily, I got a good night's sleep last night so I'm a bit more on the ball today. Not much, but I'll take even a little bit. I'm giving myself realistic goals today and going with that. I know a lot of you are waiting for an update about my grandma but I'm going to make that a separate post. I'll just mention here though that she is doing better. So since it is Wednesday, that means photo day! 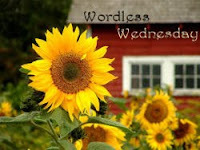 This week's theme at Sunday Shutterbugs is Fruit. Now, I honestly haven't had time to take a picture of any fruit, but I do have the pictures that I took for last week's theme. Last week, the theme was Flowers. I took the photos for it literally as I was about 10 seconds from pulling out of my driveway. Since I don't have any pictures for this week, I'm going to give y'all two-three for last week. These are both growing alongside my driveway in the flowerbed there. I so need to track down some gardening equipment so I can clear those flowerbeds out and make them gorgeous again. OK, those pics are gorgeous! I think I am going to have to put my new camera through its paces by taking some great nature pics this weekend when I am out hiking Saturday. I will upload them when I get back. You have actual flowers BLOOMING at your house? Are you KIDDING me? Argh. The iris is gorgeous! 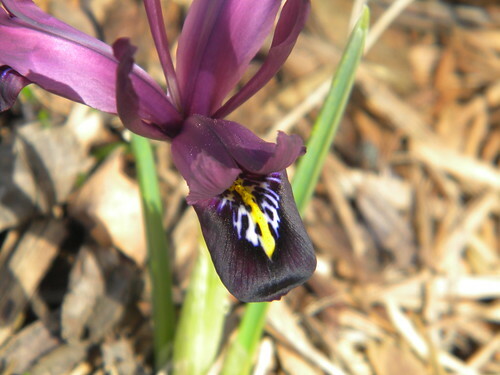 I have crocus, but I can't wait until my little irises come up. My Daffodils out front are starting to bloom. 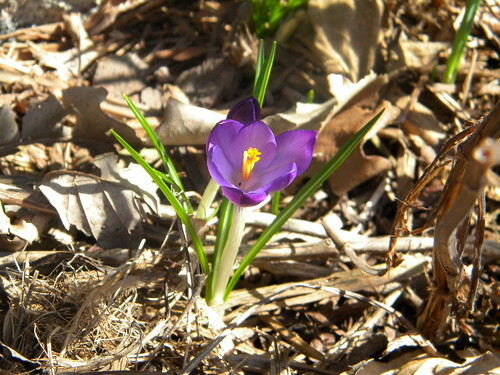 I saw the crocuses coming up last time I checked the flower bed across the way. I have my bulbs coming up in the back, but I have forgotten what they are. I want to think they are tulips. My seedlings are doing great. I really ought to put them out, but I don't think the weather is stable enough yet. Maybe another week and I can get the stuff that is in the window in the ground, then move some stuff from the germination tray up into the window. I really want my tomatoes and lettuce to do well. I am growing a salad garden this year if all goes well. Wish me luck!